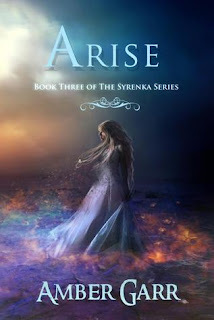 Arise, the final novel of The Syrenka Series, overflows with drama, emotions, and action! Since it's told in the perspective of both Kain Matthew and Eviana Dumahl, it better captures the intensity of the characters than the previous two novels. Discovering that both sides of their story will be shared hints at the outcome of the story, but it doesn't quite prepare readers for the drama to unfold. The plot is very straight forward. Amber Garr gets right to the point and keeps the story moving. Revelations from Betrayal are focused on more in depth and they really shake up reader perceptions of the characters. After two novels of getting to know Eviana and Matthew's friends and relationships with others, Arise pushes the bond that readers have undoubtedly created to the limits. Emotion plays a big role in the enjoyment of this novel and readers will not be disappointed.